On May 1, 1897, Louise Luetgert disappeared. Although no body was found, Chicago police arrested her husband Adolph, the owner of a large sausage factory, and charged him with her murder. The eyes of the world were still on Chicago following the success of the World’s Columbian Exposition, and the Luetgert case turned into one of the first media-fueled celebrity trials in American history. Newspapers fought one another for scoops, people across the country claimed to have seen the missing woman alive, and each new clue led to fresh rounds of speculation about the crime. Meanwhile, sausage sales plummeted nationwide as rumors circulated that Luetgert had destroyed his wife’s body in one of his factory’s meat grinders. 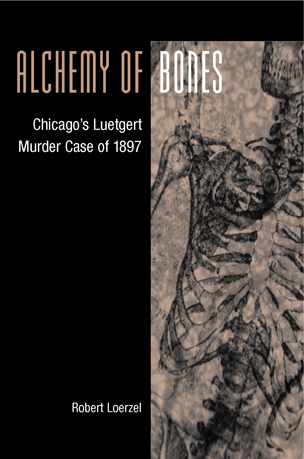 In this narrative history of the Luetgert case, Robert Loerzel brings 1890s Chicago vividly back to life. He examines not only the trial itself but also the police department and forensic specialists investigating the case, the reporters scrambling for details, and the wider society who followed their stories so voraciously. Weaving in strange-but-true subplots involving hypnotists, palmreaders, English con-artists, bullied witnesses, and insane-asylum bodysnatchers, Alchemy of Bones is more than just a true crime narrative; it is a grand, sprawling portrait of a city — and a nation — getting an early taste of the dark, chaotic twentieth century. Explore the book and the stories behind it at alchemyofbones.com. Buy the book at Amazon, Barnes & Noble or University of Illinois Press.